Congratulations to all nine tenants who were presented with achievement awards at the 2016 Annual General Meeting in November. Voted by their tenancy management team, these tenants went above and beyond in 2016 to help build a better future for their community. We are proud to have such committed tenants and would not be able to make such a difference without them. In no particular order – here are the recipients names, locations and awards (as written by their nominators). Looking forward to another exciting year with our tenants across all areas! Mrs. Marsters loves helping in the community, although she has five grandchildren under the age of fourteen in her care fulltime she always finds time to give back to her community. She volunteers making bed spreads and showing the younger generation how to sew and cook. Staff in Campbelltown are continually inspired by her strength and dignity. Mrs. Marster’s positive attitude in the face of adversity is a testament to her strength of character and shining example of resilience within our tenant community. She is a lady that lives the values of Argyle and is making a better future for our community. Bill assists everyone with their gardens and they always look fantastic. Bill is always more than happy to help his neighbours whenever needed, he has a very caring and friendly nature which his immediate community all love. Bill was the first to volunteer when a compost bin was recently donated to the Kinghorne Street complex. Bill helped to build it, then ensured all his neighbours knew how to use it. Gloria donates her time and materials to make numerous toys, beanies and rugs for distribution to the homeless. Some of these items have also been passed onto the local refuge and specialised homeless services. 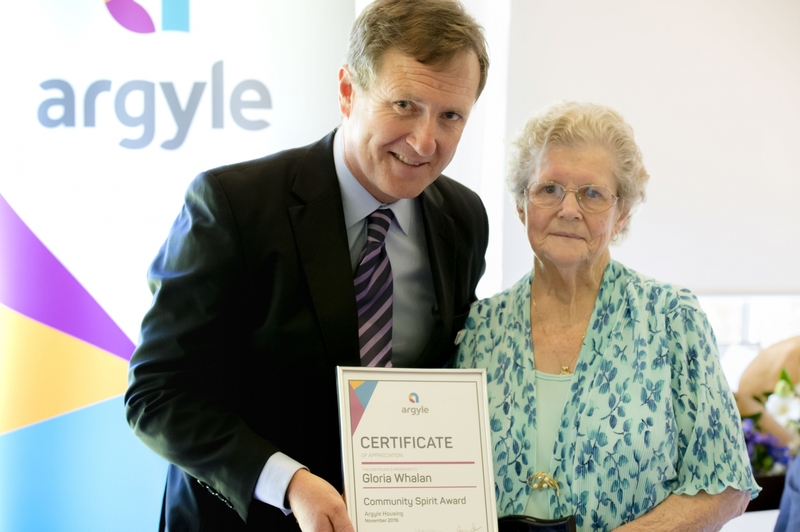 Gloria is an active participant in her community and also attends many tenant activities held by Argyle. Gloria is wonderful with making new tenants feel welcome at Argyle. Tony spends a lot of his time volunteering within the community. He is on the management committee for the local Lions Club and participates in the Community Pantry, sets up and does booklets for a local carefree singer’s club as well as feeding the animals and tidying up for visitors at the Local Wirrimbirra Plant and Animal Sanctuary. When Tony is not doing all of these helpful things he spends the rest of his time caring for a friend. Marc does a lot of work in the community. He volunteers his time to assist at St Pauls Church and was a volunteer at the Christian bookshop for several years before moving onto the Wagga Wagga City Library where his love of books, knowledge, enthusiasm, great attitude and friendly manner led to a paid position two days a week. 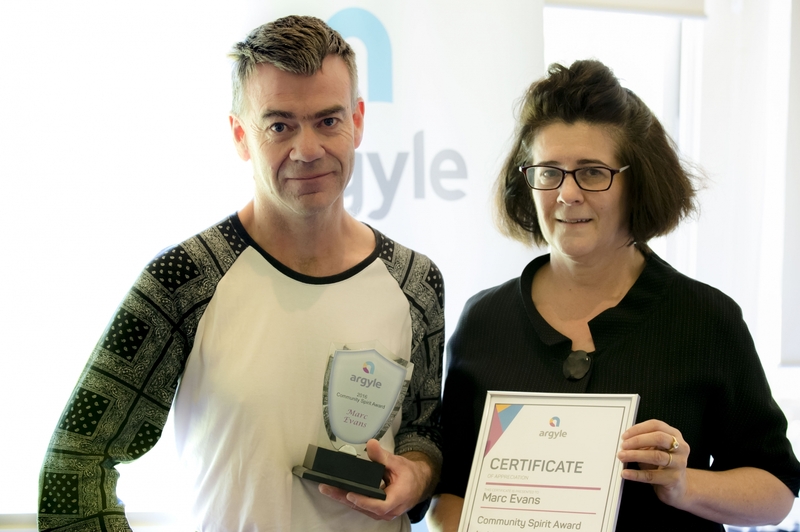 Marc is a great asset to Argyle as well as the local community. Sacha is a familiar and friendly face throughout the Common Ground building and known by most tenants and all staff there. 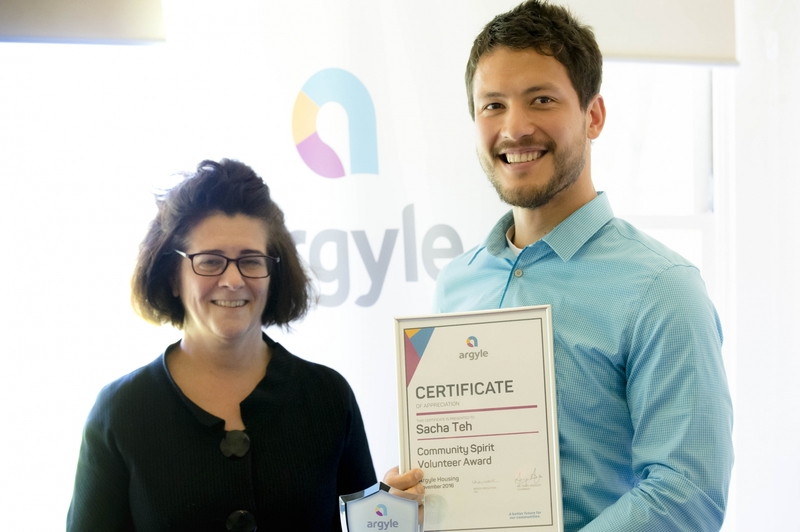 Sacha has always expressed a passion for the human element, always volunteering to help out where he can to support both staff and his neighbours and has been a driving force in the kitchen with his excellent culinary and barista skills, lending a hand and helping with the community garden project. With his knowledge of the garden, his healthy approach to life through his positive attitude and warm mannerism, his diverse and accepting nature has made Sacha an instrumental person in contributing to giving Common Ground a heartbeat. We believe that Common Ground wouldn’t be what it is today without Sacha. He is a perfect candidate for the Community Spirit Award and Volunteering Award. 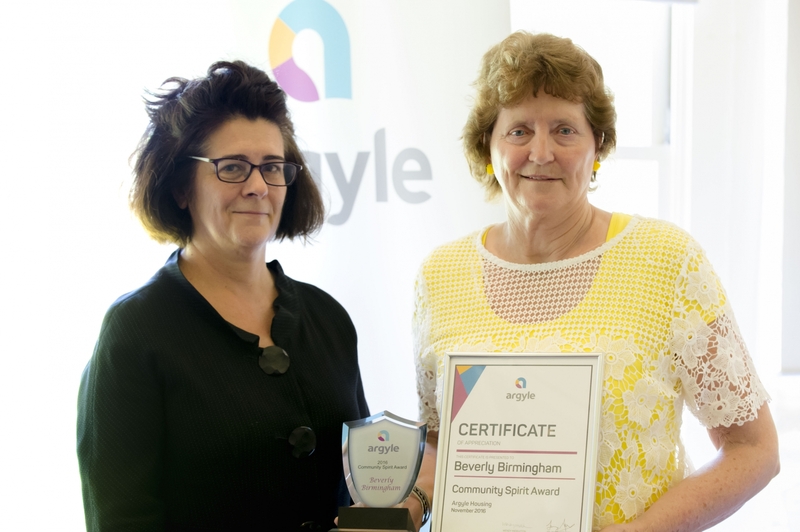 Beverly always participates in local community events and courses, she is an outstanding lady who is always happy to assist those within her community, not to mention her fellow Argyle neighbours and the staff back in the office. Beverly is a member of the Tenant Participation Committee and often volunteers her time. 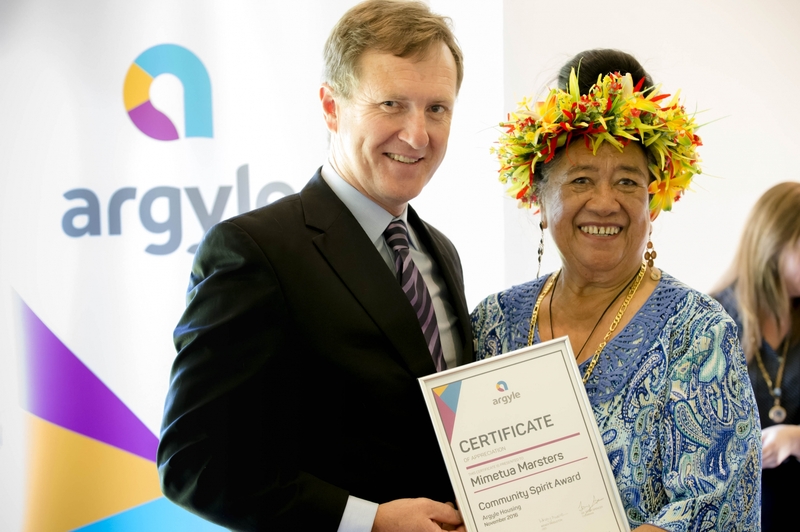 Beverly’s generosity of time, her creative flair and gorgeous personality make her a perfect candidate for the Community Spirit Award. Mark contributes to Ainslie village as a volunteer 5 days a week and is always willing to do extra. He completes the morning garbage run alongside our cleaner Pete, he assists Jim our maintenance officer with jobs and has become the chief flyscreen maker at Ainslie. Mark has an exceptional ability to complete small jobs by himself and has an efficient and tradesman like manner, he is always willing to help when something arises. Mark is also one of the fire wardens at the Village. Joshua is a young man who started his tenancy with Argyle when he was 17 years old. Joshua has gone from strength to strength during the past year and has overcome many life challenges along the way. 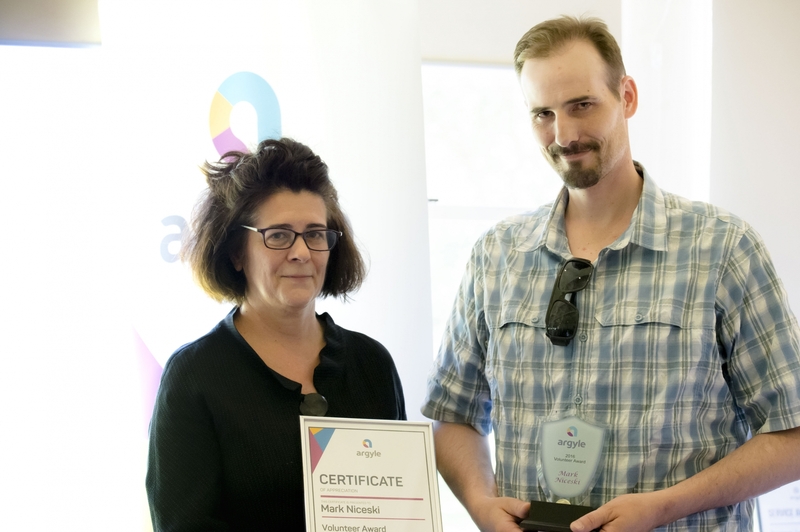 Joshua has gained stable employment and is an active participant of a local Youth Service called Reconnect. Joshua is currently mentoring other youth supporting them to stabilise their lived and is seen as a positive role model in our community. All staff in the Young office would like to nominate Joshua for a “Youth Leadership Award”.